Glass block and glass brick trends – what’s hot and what’s not today. 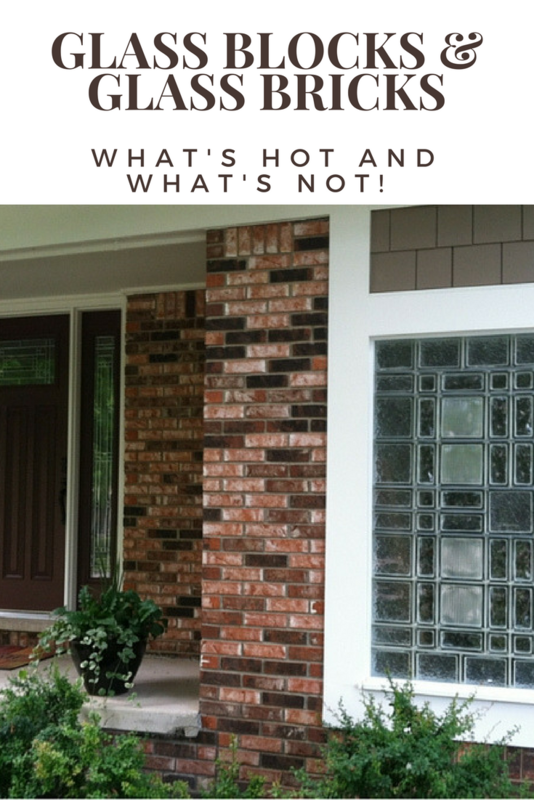 What’s hot about glass block and glass bricks? 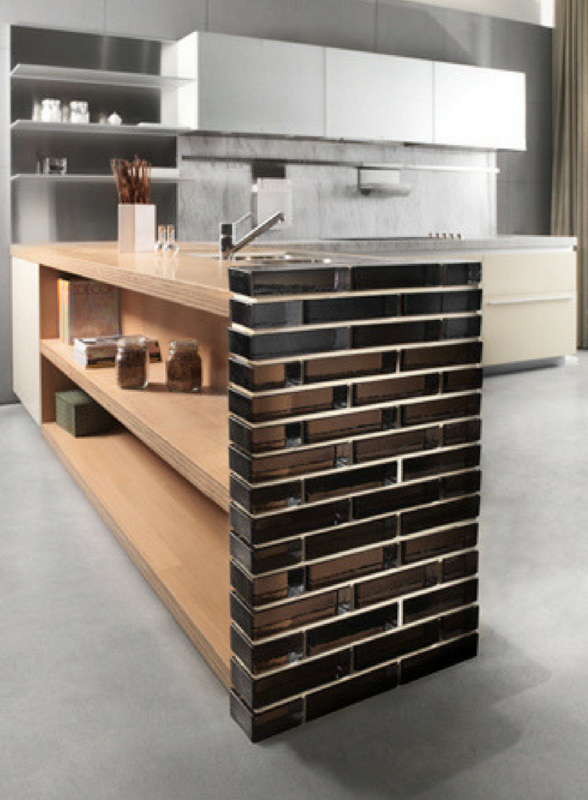 Here are 5 glass block and glass brick products, applications and systems which are happening today. Why be boring when you can be cool, eclectic or even a bit bohemian. It’s fun to express yourself in your window and wall designs. We’re seeing people ordering (and pinning like crazy if you’re a Pinterest fan) some wild stuff. 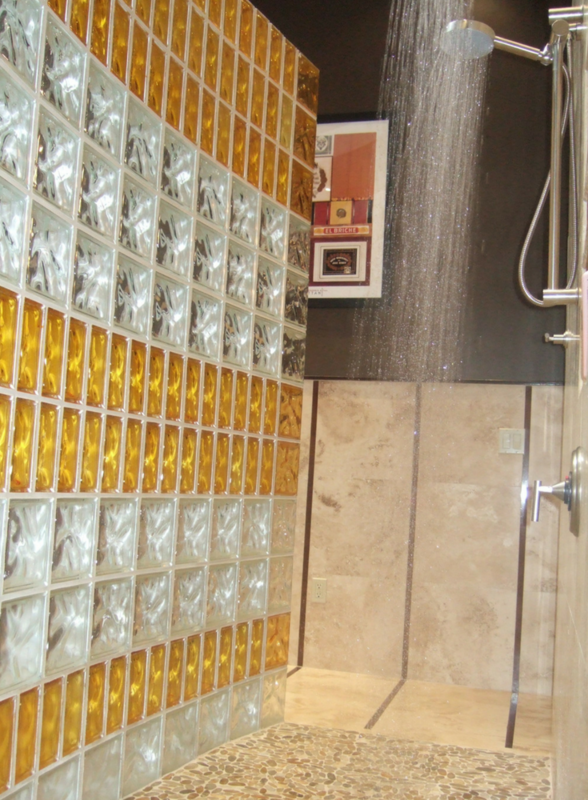 Check out below how different sizes, patterns and colors being combined in this glass block shower and bathroom window. Yes – they can make our production department a bit loopy making these funky glass block designs – but they are fun to look at and can even create the look of leaded glass – all in a structural window or wall. A stick framed (also called a drywall wall) is cheap to build. It’s also boring and can’t move light from one space or another. Because owners want more light in their homes we’re seeing the glass brick wall partition trend in Europe now making it into the U.S. These walls are sturdy, colorful and can move light through a contemporary loft or luxury home space. 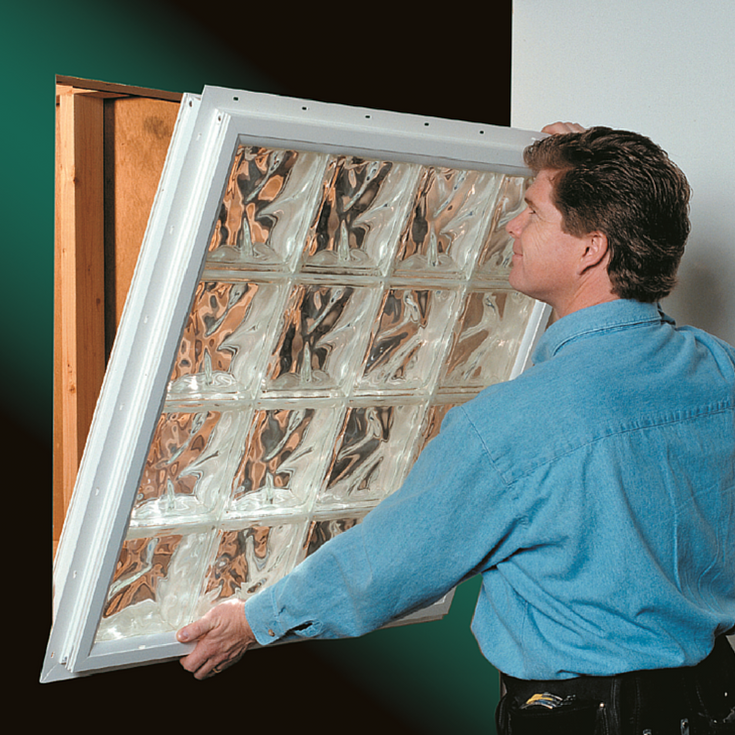 Imagine the sturdiness of glass bricks with clear or colored light coming through your wall. There is nothing quite like (sarcasm intended) a builder’s grade framed glass shower stall with the ever-present gunk (not exactly a technical term) of hair and dirt in the doorway entry. Frankly – you’ve had it with these types of showers. Yes – your builder saved money when he originally installed this flimsy framed glass enclosure into your home – but he doesn’t have to clean it! 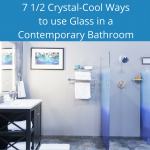 Now you’re ditching the door (so you don’t have to clean this frame EVER again) and adding curved glass block shower walls to have a cost-effective way to make a sturdy, low maintenance walk in shower. 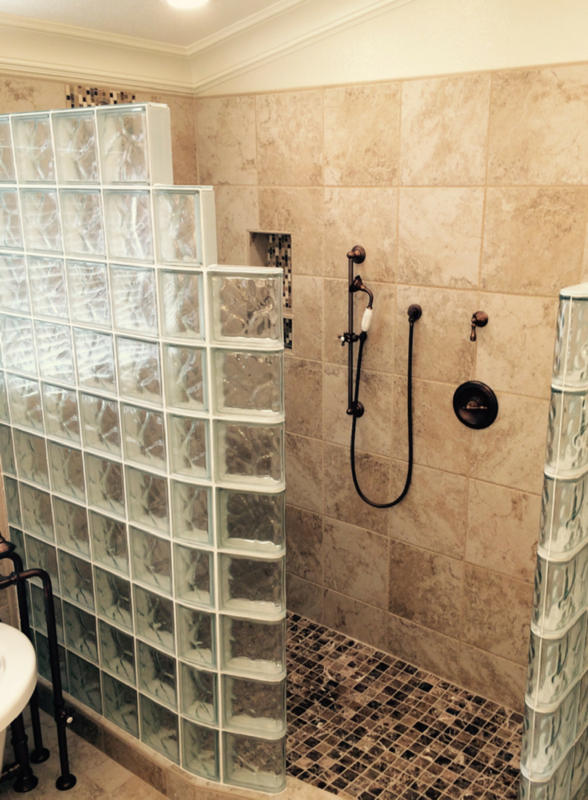 You can even add fun decorative elements (colored glass blocks, glass tile blocks etc.) to these walls and ready for tile or solid surface bases to be custom made for the walls (see the 2-wall picture below). 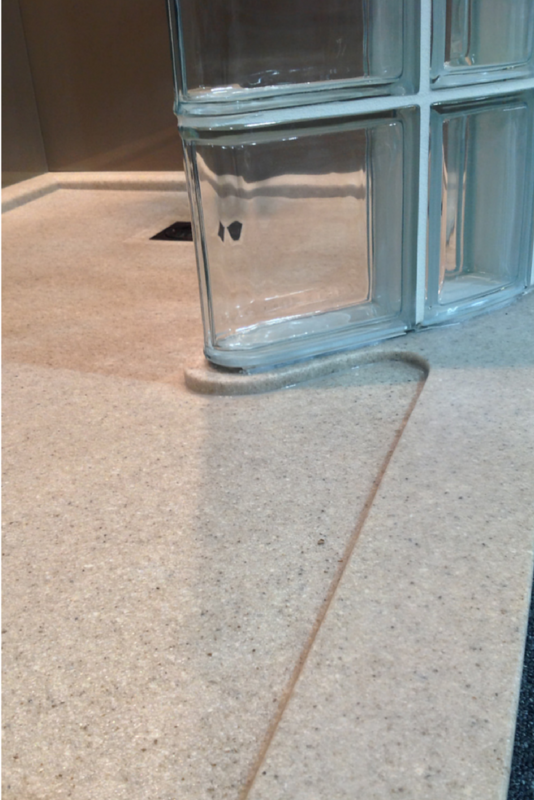 This solid surface pan was designed with the curvature of the block wall in mind. Back in the “bad old days” when someone wanted to put a glass block window into a framed upper floor of a home the contractors would start scratching their heads wondering how the heck are we going to put a product like glass blocks (which was traditionally been put together with mortar) inside of a wood framed window opening. Mortar doesn’t like wood and vice versa! 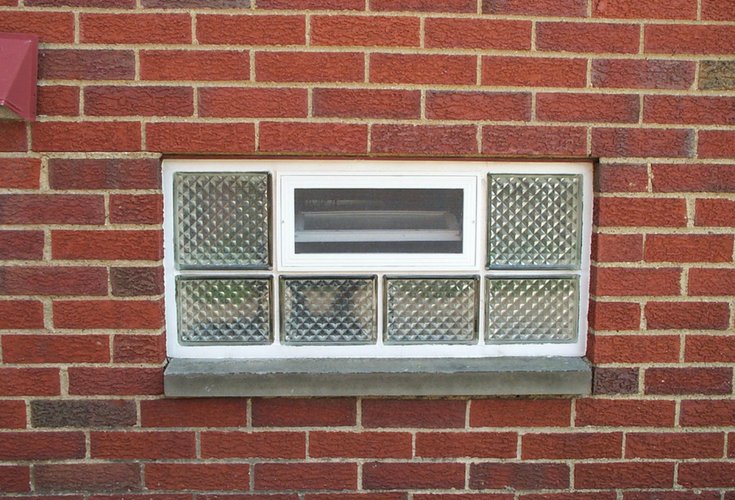 Well, the answer today is a mortar-less glass block window which is manufactured into a vinyl frame. Now a glass block bathroom window can install just like a traditional vinyl window and it’s simple and straightforward. You don’t need to beg some mason (who is too busy with “larger” jobs) to mess with your desire to have ONE high privacy glass block window, so your nosey neighbors won’t look in! See below what this window looks like while it’s being installed and one sample of a completed project. 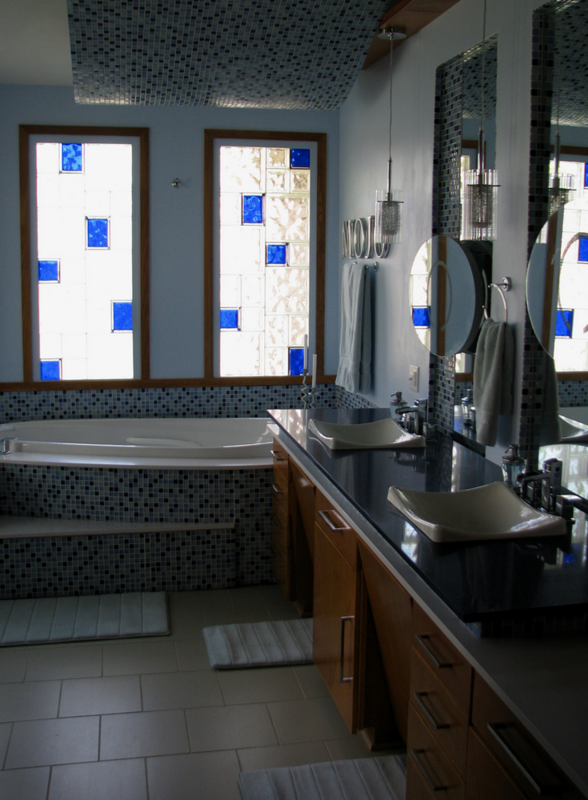 Love the pattern in this high privacy bathroom window! Clear blocks are OK but colored and frosted blocks are extraordinary. Now there are over 104 different colored glass blocks and frosted blocks which are being used in windows, walls and showers. 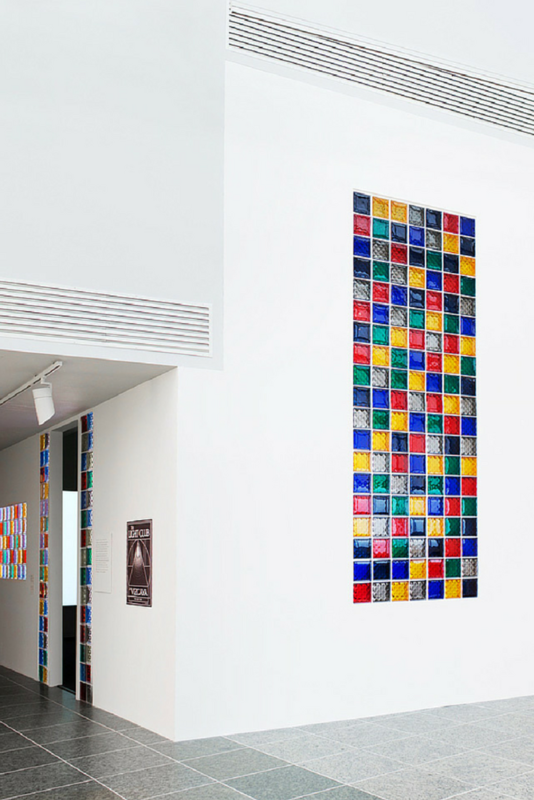 If you’d like to bring colored light into your world, glass blocks are a fun and functional way to make it happen. What’s no longer hot about glass blocks? Yes – leg warmers, dresses with shoulder pads, stirrup pants, down vests and top siders where all hot in the 1980’s but you wouldn’t be caught dead wearing them today. It’s also true that some glass block “staples’ and methods from the 80’s are no longer hot (or make sense to do) today. Let’s look at 3 not-so-hot examples. This diamond shaped block was flying off the shelves in the 1980’s protecting basement windows in the Northeast and Central states like crazy. At one point in our companies’ history it was 65% of our sales. Now – it’s down to 1%. Some manufacturers have discontinued the pattern. Hot, it’s not! Yes, it’s cost-effective to lay one glass block on top of one another (and it’s still done frequently), but the architectural community (and individual homeowners) are bored with this installation pattern. You want to mix bigger sizes and patterns together (see what’s hot in example #1) for a bit more fun in your design. To keep your costs down it’s still OK to put one block on top of another though. 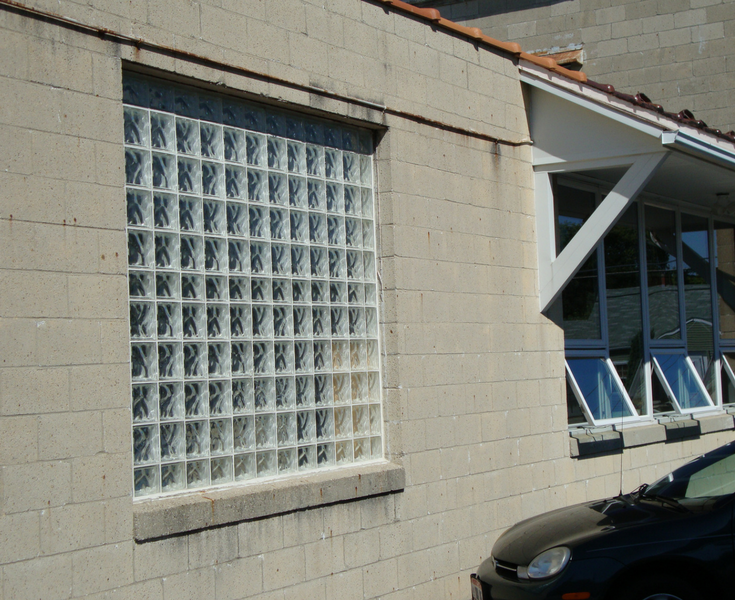 A lot of commercial factory windows are replaced with this wavy pattern block. It’s not hot from a design look however. • One – There are less of these guys around to do the work. Why is this? Well most parents aren’t telling their kids to become a mason, plumber or carpenter. Their guiding their kids into high-paying high-tech position. • Two – If you can locate one of these guys they’ll likely charge you an arm and a leg to get your job done. Why – you may ask? It’s because they don’t install glass blocks often and it’s a pain to lay them one by one. They’d rather skip this job and do a traditional clay brick or concrete block project. • Three – Their methods are old school and behind the times. With premade systems like the vinyl framed windows talked about in “what’s hot” reason #4 or preassembled glass block shower wall kits it doesn’t make sense to use a mason contractor who will put this material up one by one with wire in between the blocks for support (note – I’ve seen this wire reinforcement rust out on more than one occasion and the wall had to be taken down). Has this article changed your opinion about what’s hot and not in glass blocks? Would you like to use them now? Why or why not? Feel free to comment below or I’d love to hear your opinion. Give us a call at the numbers below to shout out your opinion or get help with nationwide wholesale supply or glass block installation (using today’s modern methods). 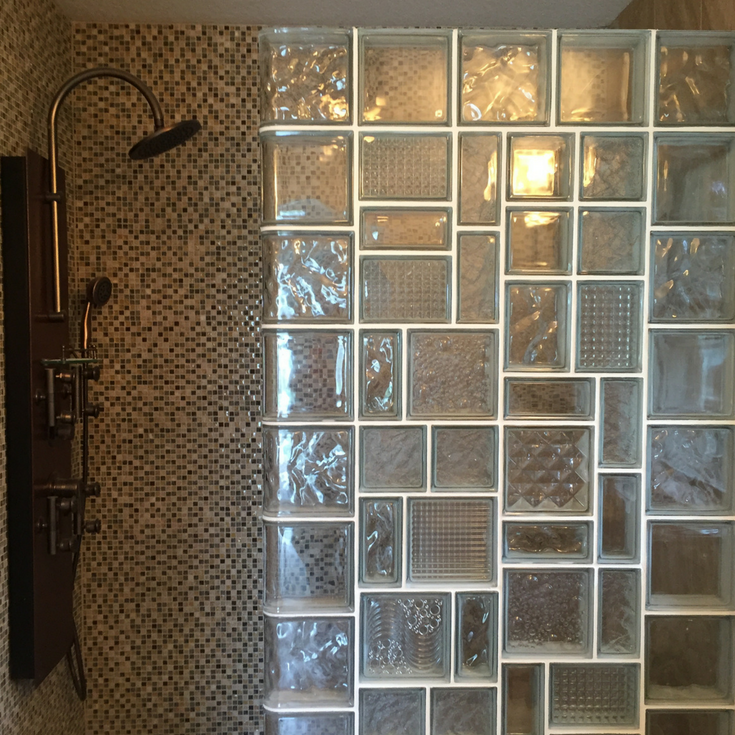 For nationwide glass block window, wall or shower design, fabrication and installation advice call Innovate Building Solutions at 877-668-5888. For a local installation service and supply contact Columbus Glass Block at 614-252-5888 or Cleveland Glass Block at 216-531-6363. This article has been very helpful! I have an large window sized opening from a room (that I want to close off) into an otherwise enclosed stairwell. I don’t want to lose the light that this opening provides and glass blocks might be the perfect solution to my dilemma. I love the leaded glass look in examples 1 and 5. Thank you! I love glass block. I like the old stuff like from the 40s. Are their companies that specialize in retro patterns? I recently inherited a “double-wide” in a very nice ‘over 55’ community in Florida. I’ve been working on updating floors and such but the bathroom looms over me. I’m torn between throwing something like the basic tub surround from the big box store in there just to freshen it up but I love the thought of a glass block walk-in shower. My question: Given the weight of the glass block or brick, would it be out of the question to install it in an almost 40 year old structure? My next question (which may be moot) but is it available in Florida? I have a man who can do it but what is the amount of time a professional carpenter/plumber would need for a project like this? 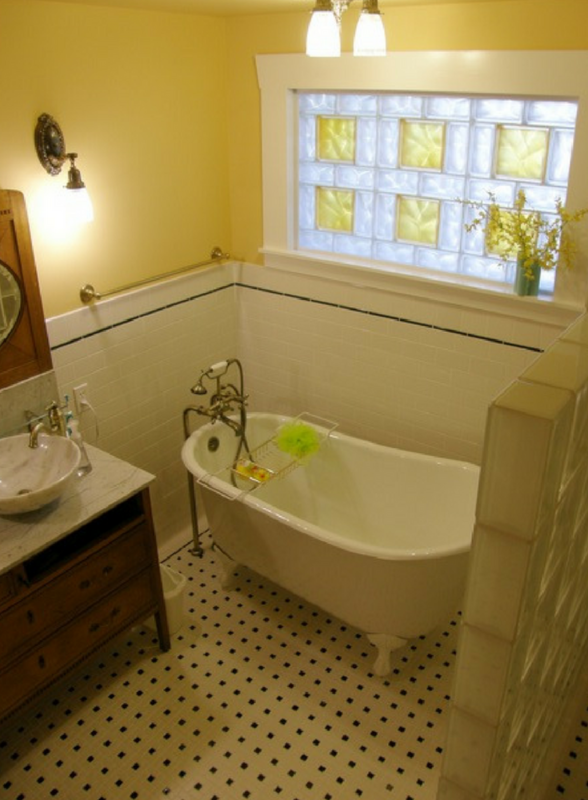 I saw a glass block shower installation on This Old House many years ago and loved it. Can you tell me when this episode occurred and the episode number? I love the glass blocks. I love the new designs and colors. Thank you for your article.